November 18, 1863 – As a result of a collision that has destroyed the Rush Street Bridge, all traffic across the river, north and south, is directed across the bridge at Clark Street. Chaos. According to the Chicago Tribune, “Yesterday afternoon, the bridge was open for a few minutes, to allow a number of vessels to pass, and the omnibuses, drays, hacks family carriages, farmers’ wagons, &c, collected until the street was completely filled at the bridge, and extending into Lake street some distance, and for fully two squares south on Clark street. Teams became restless, wagons got tangled and wedged in, drivers swore and scolded, each claiming the right of way, etc.” The paper uses the commotion to editorialize in favor of quickly filling subscriptions to build a new bridge at State Street, following up on the city’s offer to provide half of the cost of the bridge if businesses and companies would supply the other half, an amount of about $14,000. 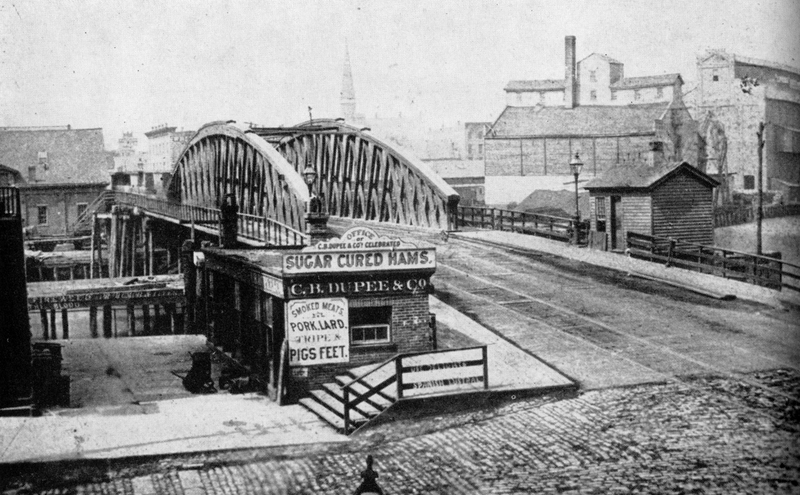 The completed State Street Bridge is shown in the 1868 photo above.